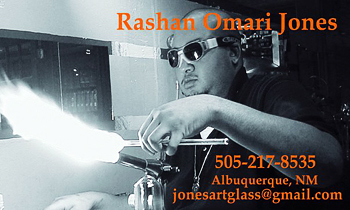 Rashan Omari Jones is a borosilicate lampworker living in Albuquerque, New Mexico. A life long passion was found in the spring of 2001 after an apprenticeship opportunity left him hopelessly addicted to molten glass. He currently works out of GreyMatter Glass Studios, in Albuquerque, and teaches across the country. Inspired by beautiful natural surroundings, Rashan's work truly captures the fire and spirit of the southwestern high desert. Organic colors and shapes are hallmarks of his natural style.